This is my go-to marinara sauce. I make it in large batches at a time and freeze a few ziplock bags and/or containers with about 3 cups or 1 quart capacity. It’s a great base sauce in which to add meat, veggies, herbs etc.. to make it different each time or it’s great on it’s own with pasta, in dishes like lasagna or my eggplant parmesan. Many people put carrots in their marinara but I don’t. If you prefer to add it by all means do so. 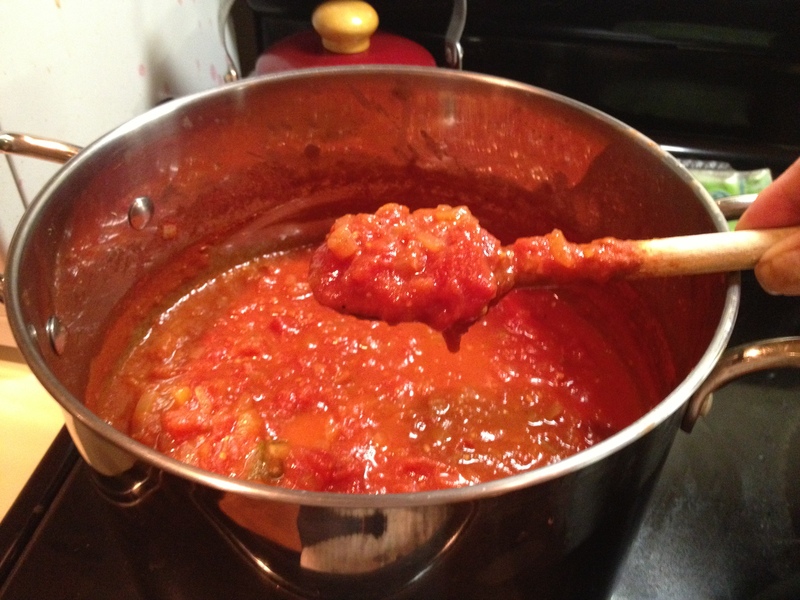 I also only use San Marzano tomatoes. Some argue that the taste is no better than other tomatoes but hey, it’s my sauce and I do taste a difference so I use them:) If you don’t want to you don’t have to but I ask you to try it at least once-and make sure you get the San Marzanos from Italy. Those famous cans with the white backgrounds and purple and/or red tomatoes on the outside aren’t from Italy-they’re from Jersey. Read the labels. Spend a little extra for the best quality that you can get. In a large stock pot over medium heat add the olive oil. When it’s hot add the onion and garlic and saute until they’re translucent, about 10 minutes. Add the celery and saute until they’re soft, about another 10 minutes. Add the tomatoes, bay leaves and salt and pepper and stir to combine. Bring to a boil and then reduce to a simmer and cook, uncovered for between 1 and 3 hours. If you’re going to package up the sauce for use at another time leave it out to cool. Note: if you’re using peeled plum tomatoes you can crush them with the potato masher after you’ve added them to the pot. Crush as much or as little as you like. I was over at my girlfriend Michelle’s house on Saturday night working on making these delicious appetizers and she was also making a big pot of sauce which smelled absolutely magnificent. 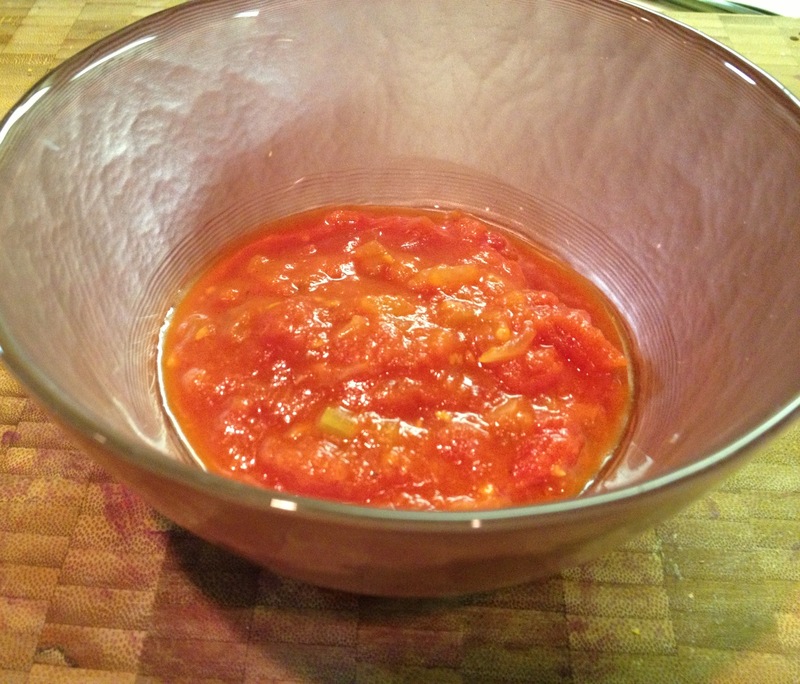 A super delicious, easy to make sauce that is very versatile. 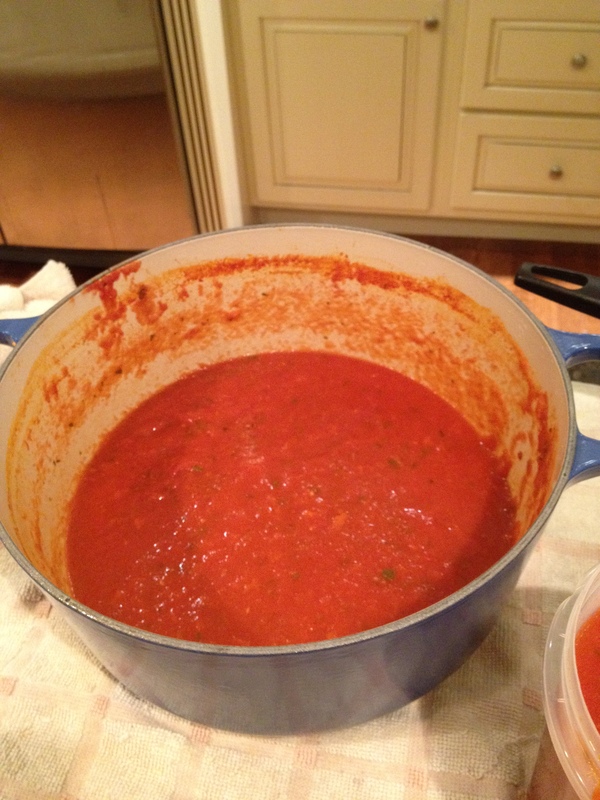 She made it to use later in the week in baked ziti but it would also be great with spaghetti or other pasta….. In a large stockpot or dutch oven over medium heat cook onion and carrot in olive oil until soft. Add all other ingredients. Bring to a boil and then reduce heat to a simmer and cook for about 2 hours.